Peach Medley pie recipe (peaches, blackberries, blueberries and raspberries mixed into a buttery and flaky homemade pie crust) is the perfect summery dessert. I just finished making the season’s first batch of pickles and dripped sticky brine all over the kitchen counters. My days are filled with a ton of dirty dishes, kitchen counters and big food messes. I’m forever looking for innovative ways to quickly clean up the mess I’ve created, so I can still spend quality time with my family. Peaches are ready in North Carolina and I’m ready for pie season! Bubbling, juicy, baked on fruit deliciousness but can be a challenge to clean up. These new Scotch-Brite® Scrubbing Dish Cloths make cleanup a breeze. These premium weaved cloths are machine washable, sturdy and you’ll be able to use them again, all with the power of Scotch-Brite® scrubbing dots for a quicker and easier clean – LOVE that! Scrubbing Power Makes Cleaning Easy! 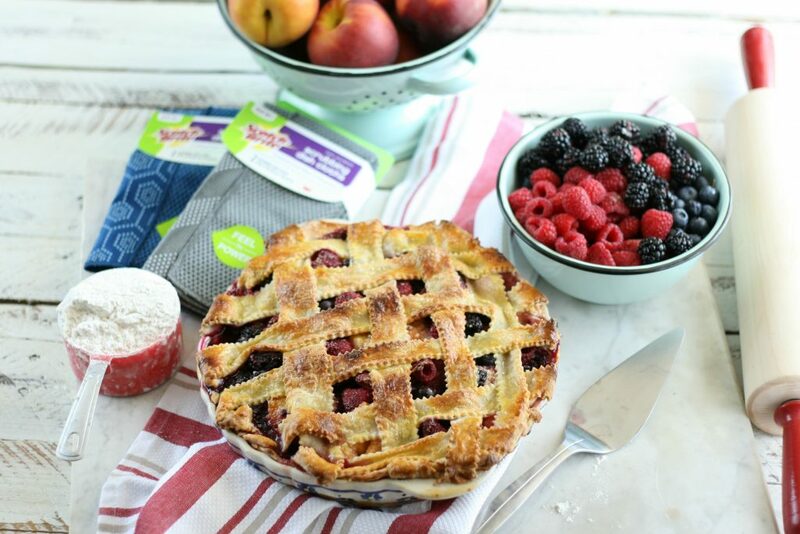 A lattice pie crust is really simple. Here I’ve used a scalloped pastry wheel. Just roll out the dough and cut strips. (nothing says they have to be exactly the same size) Place 3 to 5 strips of pie dough going one direction. Pull back every other piece, slightly. Then place one strip of pie dough the opposite way. Continue to do this and weave the crust until the entire pie is covered. Tip: Keep your pie dough ice cold and do not overwork it. This will help you achieve that flaky crust. If it warms up too much while you are working with it, simply plop the entire pie in the fridge and the bag of pie dough in the freezer for a quick chill. Then you can continue to work on creating your masterpiece. Check out the recipe below! I’ve also walked you through how to weave a pie crust. Simple and so beautiful. I really hope you enjoy this one! With so many peaches, nectarines, and fresh berries coming into season, you can bet there will be plenty of pie being made here. I mean, who doesn’t love a warm, gooey, flaky, buttery crust melting in your mouth? Step 1: Everything should have a place it belongs. Keep everything organized and in place- so when you want to make something, you’re not searching and wasting time to find that tool, dish or ingredient. Plastic containers with lids keep my measuring cups, spoons, spatulas and everything I need to bake accessible, organized and clean. Step 2: Clean as you go- it’s so much easier to keep up with the mess if you clean a little at a time. 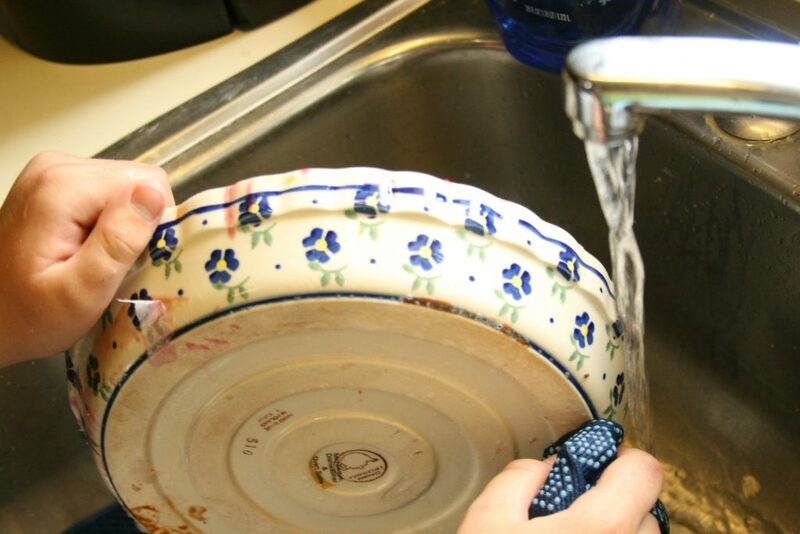 Plus, you won’t be overwhelmed at the end and clean up will be a snap. Step 3: Beautiful tempered glass jars with lids keep flour, sugar, brown sugar, powdered sugar and rolled oats easily accessible on my counters and also displays it pretty. Extra of each sits up off the ground on a stainless steel rack. Always rotate these by date, keeping your ingredients fresh. Step 5: Keep a 5-gallon bucket in the kitchen and drop anything to compost into it (coffee grounds with the paper filter, egg shells, egg cartons, newspapers, vegetable/fruit scraps, etc.). This way you can easily carry the entire bucket out to your compost pile, empty and rinse out. Keeping your kitchen clean and doing good for the environment all in one. 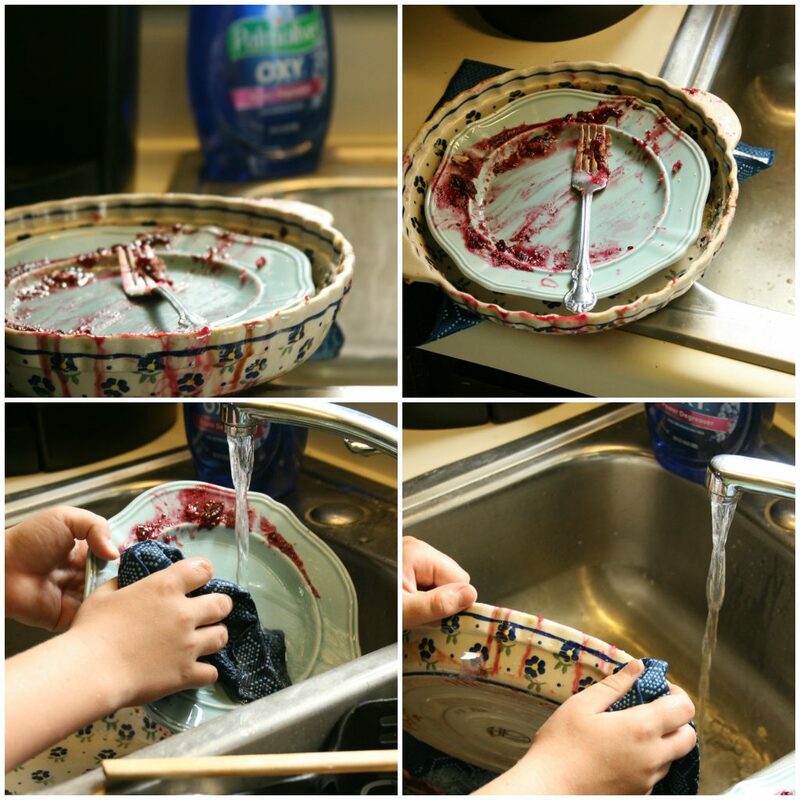 We all need as many cleaning tips as possible- to help make our lives easier! You’ll find these super charged dish cloths down the Household Supplies aisle- with the rest of the great Scotch-Brite products. OR order them on Amazon!! I love that you can just toss them in the washing machine to get them clean and sanitized! If you don’t have time to shop at Target, you can simply order these Scotchbrite dish cloths on Amazon! Saving you lots of time! Isn’t this Polish Pottery pie dish so pretty?! Find them on Amazon! 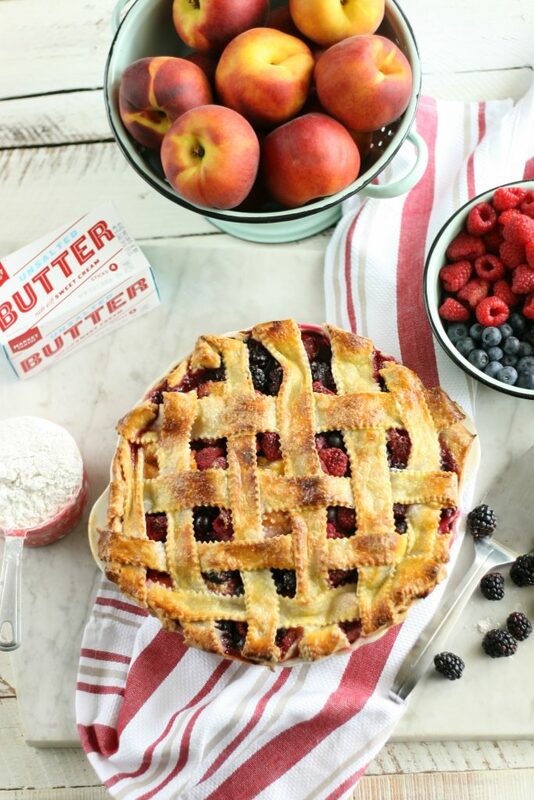 Summer berries and ripe peaches make this homemade pie the perfect summer dessert. In a large bowl, mix together flour, sugar, and salt. Cut up the cold butter and cream cheese into smaller pieces and toss them in the flour mixture. Using a pastry cutter or two forks, cut in the butter and cream cheese until you have pieces the size of peas. Add ice cubes to a liquid measuring cup and then cold water. Add a little water at a time, and gently toss the mixture around until it will stay together in your hand. As it clumps together, pull the dough out and place into a large zip-style bag. Refrigerate the dough for a minimum of 2 hours or overnight. Place the fruit, sugar, tapioca and lemon juice into a large bowl. Gently toss with a spoon and set aside. Divide the dough into two equal pieces. Roll out one half on a floured surface. Fold it into quarters to safely lift and place into a 9-inch pie dish. Trim any excess of pie dough with kitchen shears. Pour the fruit mixture into the pie shell. Roll out the remaining half and cut into strips using either a pastry roller, small pizza cutter or sharp knife. Place 3 to 5 strips of pie dough going one direction. Pull back every other piece, slightly. Then place one strip of pie dough the opposite way. Continue to do this and weave the crust until the entire pie is covered. Lightly brush the entire pie with an egg wash and sprinkle with granulated sugar. Bake in a preheated 400 degree F oven for about 60 to 70 minutes. Or until the crust is golden brown and the fruit is bubbling. Let the pie cool completely before slicing. Place the entire pie on a half sheet pan lined with parchment paper. This will catch any juices that drip and make cleanup a breeze! It’s pretty easy! It looks impressive and you’ll be proud of yourself! They don’t have to be perfect. I love your tips! 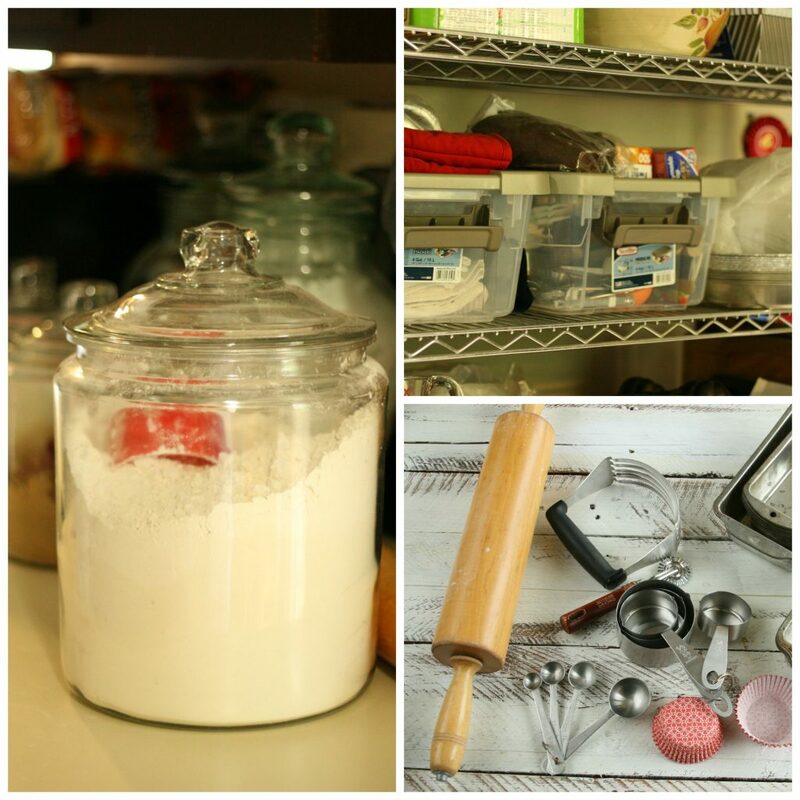 It’s so funny how much alike we are, I don’t know what I would do without my stainless steel racks, organized measuring stuffs, compost bin in the kitchen, and pretty glass jars of flour and sugar! I love berries, and combining them all together in a pie is heaven! Id love to try this recipe, the pictures alone makes me crave for one. Thanks for sharing your recipe! It’s looking great and looking so easy, I’ll be trying it today! These are all great tips. I will keep them in mind. Thank you for sharing this delicious recipe. This looks amaaaaaaazing! We go to pick peaches annually, I think we’re going to give this recipe a try. I do love baking and cooking a lot for my family but sometimes making a crust pie is so hard for me. This pie recipe pushes me to try it again and hope it will go well, by the way that peach medley pie looks really delicious. So yummy! 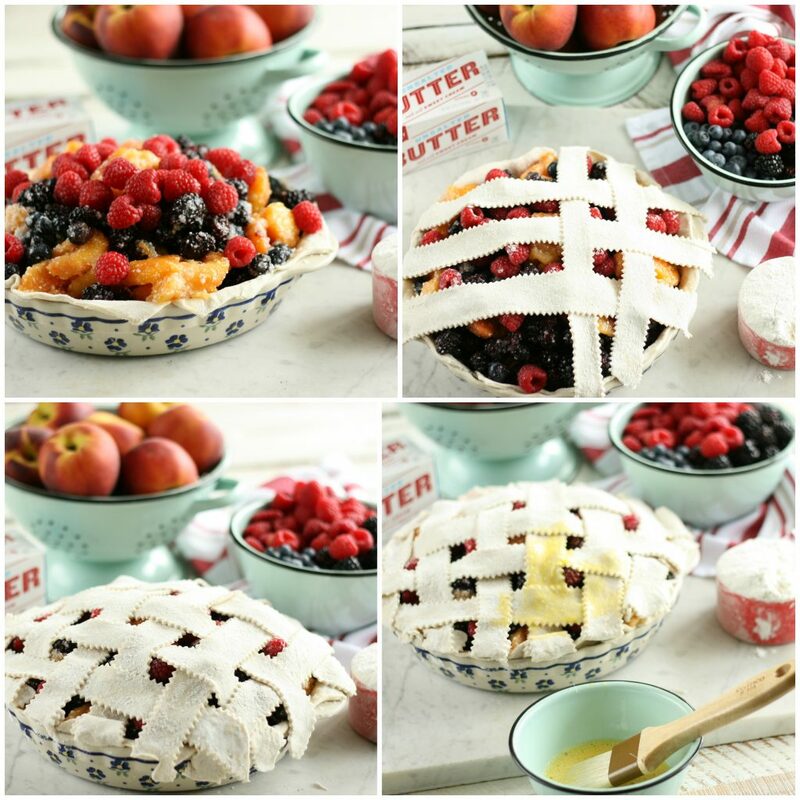 Just in time, I have all the ingredients at home and we love fruit pies! That looks picture perfect! I would love to have a slice or five of this! Thanks so much!! It’s a pretty amazing pie! Glad you stopped by! I’ll love to have the dish cloth. After having such a delicious pie, I just want to do less work and continue the happiness. Your pie looks amazing! I’d love to try this recipe as I grew up with a peach tree in our yard. I always think of home when I eat a peach! Such fond memories! We had an apple tree in our yard growing up! That is such a beautiful pie and it reminds me of the ones you see on baking shows on television. It wouldn’t have lasted long in our home since my husband and sons have sweet tooth.